Generally speaking, enabling huge text fields in NAV is bad design because it encourages dumping unstructured data into the system. Reason Codes is an example of adding useful, structured data to the system. But, every once in a while, there’s a legitimate need to write up a large chunk of text. The Notes functionality isn’t bad for that, but try adding that to a Report or a FastTab. When that need comes along, you can do it natively now using the built-in RTC tools. I’m using a case scenario for a company that performed contractual maintenance tasks for their customers and they needed a free-text place to enter information about the work done each site visit that would then print on a report. First, you need a place for the data to live. We’ll create it as a BLOB, but there’s a handy SubType we’ll want to set called Memo. For universal access to the functions we’ll need, two public Functions are just the thing. SetWorkPerformed sets the value of the blob from a Text (size unlimited) variable using TempBlob’s handy “WriteAsText” function. 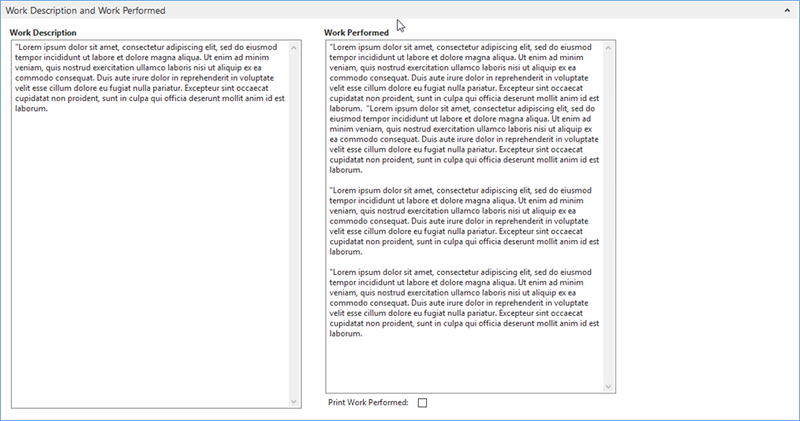 GetWorkPerformed does the reverse, returning the raw BLOB text as Text using the TempBlob’s ReadAsText function. That’s it, though you’ll notice we have a couple things in there dealing with Line Feeds and Text Encoding, so you may have to adjust those based on your regional/platform needs. Now, the page is pretty simple. We also need our equivalent of Setters and Getters. You can refactor this to Eventing if you want – this customer was on a version that had limited support for it. First, we have to fetch the values to the Variable. When the page loads a record, we populate the Text variables with our Record’s function. Same as the Page. 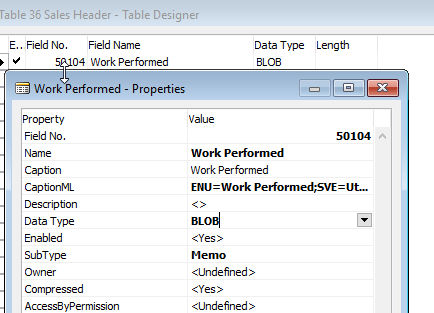 Use your Getter to load a Text variable, then add that to the Report’s Data model. That simple. Bear in mind there will still be limits to this field – it’s a BLOB, so you have to jump through hoops to work with the contents. If someone asks if you can filter on it, the answer is “No*”. You could provide a really, really slow MARKED(TRUE); search function that could scan through them, but start with no. If it’s something that needs to be filtered or searched on, it should be structured data. Dynamics NAV, Featured Posts, NAV Customizations, NAV Development. permalink. Entirely correct! Something must have nixed a couple of key images during a WordPress update I did a little while back. I’ve updated the two key missing areas, probably in a better way than I had before. Forgive me for being naive, but I am new to C/AL and NAV development. Where are these procedures supposed to go? Hmm, Ok, hard to explain in a Blog Comment – limited formatting – but I’ll give it a whirl. Each Procedure in this case is a Global Function on the Table. The things in Parenthesis on those lines are the Parameters (C/AL Locals) with their types. The items under the VAR section are the Local Variables for those functions (with their type info). The BEGIN / ENDs in these sections are the code. But – word of caution here, since you’re new to development: In NAV (not the modern Business Central versions), to access Code on tables, you have to have either a Partner Development license or work in a company that purchased the relevant development license granules from Microsoft (through your NAV Partner). You might also want to check out: https://nav-skills.com/webinars/ since they’re running a wide array of free development training webinars.